Pete mentioned I had the blast gates installed backwards due to the direction the screw locks the gate. What he said was correct but in my case doesn’t matter. I only use the screw when I am holding the gate in the open position. I later found out that the screw threads are on both sides of the gate so you can change sides as necessary. I will only ground the system if it shocks me. If you’re worried about explosions please read these two articles. Article 1 and article 2. Working on second channel stuff due to rain for the first part of this week. Jay, do not worry about what the so called pundits say. They are not there helping you on your projects. They are doing the same thing to our President. Jay keep up the good work and fret not the naysayers. They , like the poor will be with us always. I am a big fan of your work as well as of Nick and April. Today I am getting a new band saw similar to yours. A Grizzly Go555lx with mobile base and riser. Love your work and follow the three of you each week. I don’t recall you mentioning your lathe in the videos regarding the dust collection mods. Did you get rid of your lathe. Dust collection is important when sanding your turnings so how are you handling it. I Always enjoy your projects. Hey Robert. Look at the Rockler lathe dust collector (Item 52981). I have mine going up to a 4″ adapter so that it will attach to my dust collector and when sanding I don’t get any dust. 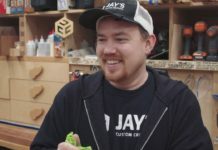 Jay, I’ve been using plastic pipe on my 3 dust collectors for more than 10 years. I have one on my table saw, another for router table and two sanders, and one for my jointer & planer. There is no grounding to any of them. No sparks, no shocks. Don’t worry about it. ~ Keep up the good work. How do you know you are effective? You get negative responses. The ability to comment negatively, anonymously, is to tempting for many. Your site is great. Don’t let them get you down. I have a complaint! The green pipe…….ugh! Need to slap some of the Jay Bates orange or red wings colors on it. Haha! Big fan for years now. Keep up the good work dude! Keep up the great work! I enjoy following your sites and they are very helpful as I am a new woodworker. Thank you, thank you, thank you. I, for one enjoy you work. You have rekindled my passion for woodworking and taught me a few more things in the process. The mask overlay on your respirator was cute – you excel in fun little details. Keep it up. Suggestion. Use tight_fitting (no glue) dowels to attach a sacrificial piece to the blaster push stick. Then you can pop them out to put a new piece in place. As for the dust collection issue; I have a similar setup and looked into grounding issue. I even bought the uncoated wire to do it. In order to ground PVC you need to run wire around the outside AND through the inside using screws through the PVC to connect the two. Also you need to do this at every joint. After doing the research I found that there was not a single proven instance of a dust fire started by static. Having said that there IS one piece of equipment I will be grounding (as soon I get around to it) and that is the planer. I am using a piece of flex from Rockler to move between my planer and my jointer and I have seen sparks jump from the exposed end of the wire inside the flex to the housing of the jointer. 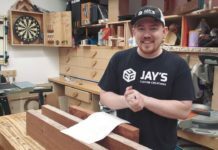 Great videos I am just to getting into woodworking and am learning a lot! I also mentioned that there is static in my system as the wood leaves the planer via the flex hose.. I run my planer thru a garbage can cyclone before it reaches my dust collector. (It’s much easier to handle and empty than the cardboard can at the dust collector). I also am not worried on a static elecrticity explosion/ fire. But my system does put out enough to make the hair in my arms and legs stand up… I haven’t been shocked but it feels pretty intense. So please address this issue if your system does the same. As I’m not sure if I can change this. Believe you and the article about explosive dust. My problem is that I get so much static built up in the material IN the collector bin that when you take the lid off it starts to jump out and attache itself to my jacket, etc. and gets all over. Also when I dump it out it sticks to the walls of my 5 gal. bucket. Any use trying to dissipate this static charge? I wasted many hours grounding my 4″ dust collection piping. Then seen the same videos you referenced, and wow. If I had only seen them first. :-( Naysayers and trolls are always in the back ground. They kind of remind me of the garden gnomes, you don’t always see them, but when you do, they set you back…..lol. Can’t wait to see you back out in the shop. Thanks for such great content. Jay a little FYI. The energy used by a DC to spool up is shocking. I have the Neurio electricity home monitor which displays the watts being used. When my 2hp DC is turned on the watts used jumps to 8,000. After it has spooled up it only uses 1,000 watts. As a result I leave the DC running while I re-adjust my fence or if I’m moving from Jointer to TS. I’ve also read it’s better for the motor. I installed my DC a year ago, it’s one of those, “Wish I’d done that sooner” items. Not get back to work.